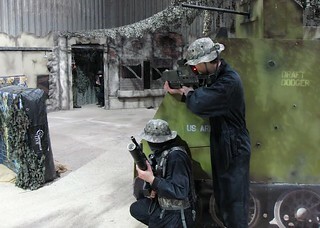 Virtual warfare is a team based combat event that enables the players to enjoy the thrill of a warfare game without getting hit by projectiles or getting dirty and muddy as in the case of Paintball.We have come up with a complete list of virtual warfare options all over the country. Gobananas specilaise in party planning for groups and can help you organise your day out perfectly. All you need to do is to hit the opponent using an infrared beam at over 150 m distance. This exciting indoor shooting game does not require any previous experience and is well suited for all age groups.A good group activity for all ages, virtual warfare is available in various destinations and schedules. Check our prices and availability to find the best deals in various locations. In case you need any tips on choosing the best virtual warfare options, all you need to do is to call us and we can give you bespoke party planning tips and ideas too.